On the route of the Trans-Siberian railway, the city of Krasnoyarsk is a good stop between the major destinations of Yekaterinburg and Irkutsk. Among Russian tourists, the city is known as a destination for extreme sports. Krasnoyarsk, a major stop for travelers on the Trans-Siberian railway, is almost 1,500 miles from Yekaterinburg, the first big destination on the journey from Moscow to the east. It took 37 hours to make the trip between Krasnoyarsk and Yekaterinburg by train. With beautiful Siberian scenery outside the window, the journey passed in a haze of questioning. My friend Juliet and I were taking the Trans-Siberian across the country – by ourselves – and therefore at every point in our travels, the second question we were asked was: “What do your husbands think of you doing this trip alone?” (The first question was, naturally, “Where are you going?”). In regards to the marriage question, it is a truth universally acknowledged that Russian women tend to marry before their Western counterparts. Getting married is big in Russia. Near the ubiquitous sushi restaurant on almost every corner in every big Russian city, there is also a bridal salon, so it was not surprising that we were asked whether or not we were married. What was surprising was the voracity of the questioning. Our replies that, as young women in our early 20s, we hadn’t really considered taking a trip down the aisle, were invariably greeted with an expression of horror and the suggestion that maybe we should think about it because, clearly, our time was ticking away. Trying to get a break from the Russians who kept asking us this question, I was wandering through our train carriage looking for a bottle opener when I ran into four Spaniards who were having trouble breaking down the linguistic barrier with the provodnitsa (carriage attendant). In addition to English and Russian, I speak some Spanish, but I had not quite planned for a situation in which I would need to translate between some very agitated Spanish tourists and a very frustrated Russian Railways employee. What the Spaniards wanted was sheets and pillows for their bed. To avoid this pitfall yourself, make sure you ask for a ticket with bedding: с бельем – s byelem. Five minutes of complicated, many-gestured negotiations later, everybody had what they wanted, and Juliet and I were rewarded with a delicious chorizo sausage and interesting conversation with no mention of marriage for the rest of the journey. We said goodbye to our new friends when the train arrived in Krasnoyarsk. We had made reservations in the Kiwi Hostel; a short bus ride from the old part of the city. It’s a great hotel – if slightly difficult to find – but unfortunately check-in opens only at 2 p.m. We called a member of the hotel staff to let us in and then decided to go grab something to eat at a nearby coffee shop. 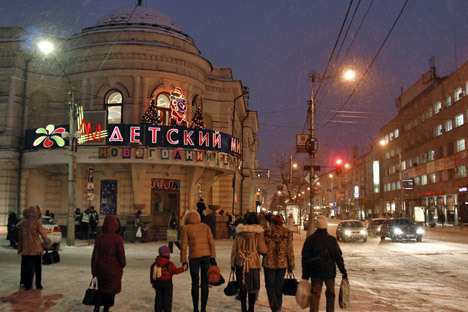 Krasnoyarsk is a nice city and, as in Yekaterinburg, some of the buildings are better preserved than those in the big cities in western Russia. We hadn’t chosen Krasnoyarsk for the sights, though. The decision to get off the train here was purely based on our lack of desire to spend 60 hours on a train from Yekaterinburg to Ulan-Ude. But Krasnoyarsk is a good place to break the journey. It can be a peaceful place to pass a day or two, or, you can take part in extreme sports. One of the principal draws of this Siberian city is the Krasnoyarsk Stolby Nature Preserve and Bobrovy Log ski resort. The preserve is only a short trip out of the city on a marshrutka – a small and battered minibus that follows a fixed route – that deposits visitors at the bottom of the brand-spanking-new ski slope. The ski complex appears imported whole from Germany. In winter, temperatures can drop far below -25, causing even the hardiest skiers to retreat to the lodge, but in the summer, visitors can go zorbing, swimming or take the chairlift up the mountain to the stolby. In Russian, stolby means pillars and the rocks stand tall in all shapes and sizes and are perfect for scrambling over. It would be quite easy to pass a whole day in Krasnoyarsk just climbing the stolby. If you are travelling with a big group, you can rent a picnic area at the top of the mountain. Here you can have lunch in splendor, looking out across the tops of thousands of Siberian pine trees below. But even those without a large group or a large budget can appreciate the view from one of the many flat stolby that line the top of the mountain like platforms. They are the perfect place on which to sit and think, leaving the chaos below behind. Descending from one of the stolby we were transported out of the Alps straight back into Russian life. A wedding party – bride and all – were taking a stroll on the top of the mountain. I suppose the stunning scenery is an amazing backdrop for any wedding photograph. I could not help think, however, of the bride having to bundle herself into a chairlift carrying a glass of Sovietskoe Shampanskoe (Soviet Champagne) and wearing a white dress three feet wide. The city of Krasnoyarsk itself is also actually quite a pleasant place to simply wander. There are several coffee shops in the main part of town that serve decent snacks, which makes up for the lack of Internet connectivity. There is also a range of restaurants serving a variety of international food – the obligatory sushi place is augmented in Krasnoyarsk by Chinese and Indian cafes. We decided it might be nice to have some Indian food, but alas, the Indian restaurant was booked for a wedding. After sitting down in the Chinese place, we passed several hours deep in conversation about weddings, trying to determine if we were, in fact, on the shelf. None the wiser several cocktails later, we made our way outside, no more prepared to confront the inevitable questions that would accompany the next leg of our journey on the Trans-Siberian.